The Treaty of Versailles (signed in 1919) and the 1921 London Schedule of Payments required Germany to pay 132 billion gold marks (US$33 billion) in reparations to cover civilian damage caused during the war. This figure was divided into three categories of bonds: A, B, and C. Of these, Germany was required to pay towards 'A' and 'B' bonds totaling 50 billion marks (US$12.5 billion) unconditionally. The payment of the remaining 'C' bonds was interest free and contingent on the Weimar Republic's ability to pay, as was to be assessed by an Allied committee. The Goldmark was the currency used in the German Empire from 1873 to 1914. The Papiermark refers to the German currency from 4 August 1914 when the link between the Mark and gold was abandoned. Due to the lack of reparation payments by Germany, France occupied the Ruhr in 1923 to enforce payments, causing an international crisis that resulted in the implementation of the Dawes Plan in 1924. This plan outlined a new payment method and raised international loans to help Germany to meet its reparation commitments. Despite this, by 1928 Germany called for a new payment plan, resulting in the Young Plan that established the German reparation requirements at 112 billion marks (US$26.3 billion) and created a schedule of payments that would see Germany complete payments by 1988. With the collapse of the German economy in 1931, reparations were suspended for a year and in 1932 during the Lausanne Conference they were cancelled altogether. Between 1919 and 1932, Germany paid less than 21 billion marks in reparations. The German people saw reparations as a national humiliation; the German Government worked to undermine the validity of the Treaty of Versailles and the requirement to pay. British economist John Maynard Keynes called the treaty a Carthaginian peace that would economically destroy Germany. His arguments had a profound effect on historians, politicians, and the public at large. 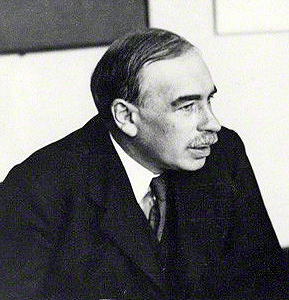 Despite Keynes' arguments and those by later historians supporting or reinforcing Keynes' views, the consensus of contemporary historians is that reparations were not as intolerable as the Germans or Keynes had suggested and were within Germany's capacity to pay had there been the political will to do so. Following the Second World War, West Germany took up payments. The 1953 London Agreement on German External Debts resulted in an agreement to pay 50 per cent of the remaining balance. The final payment was made on 3 October 2010, settling German loan debts in regard to reparations. 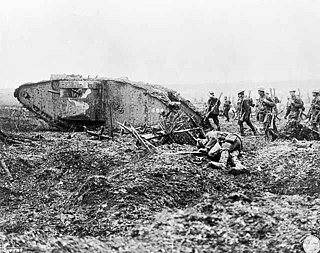 Although considerable conflict took place outside Europe, the European theatre was the main theatre of operations during World War I and was where the war began and ended. During the four years of conflict, battle was joined by armies of unprecedented size equipped with new mechanized technologies, leaving millions dead or wounded. The African Theatre of World War I describes campaigns in North Africa instigated by the German and Ottoman empires, local rebellions against European colonial rule and Allied campaigns against the German colonies of Kamerun, Togoland, German South West Africa and German East Africa which were fought by German Schutztruppe, local resistance movements and forces of the British Empire, France, Italy, Belgium and Portugal. The opening of the Second Hague Conference: one of the two conferences aimed at implementing the Young Plan. A logarithmic scale depicting Weimar hyperinflation to 1923. 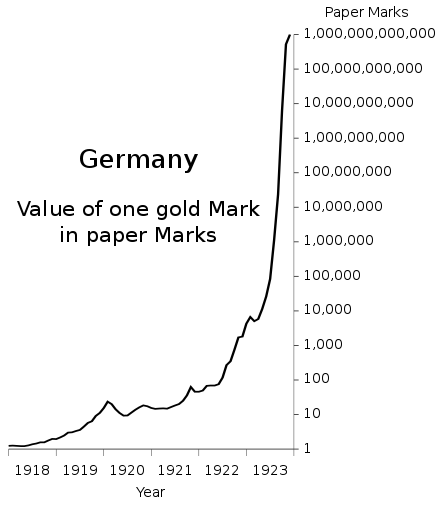 One paper Mark per Gold Mark increased to one trillion paper Marks per Gold Mark. ↑ Henig 1995, p. 63. ↑ Simkins, Jukes & Hickey 2003, p. 9. ↑ Tucker & Roberts 2005, p. 429. ↑ Beller 2007, pp. 182–95. ↑ Simkins 2002, p. 71. ↑ Tucker & Roberts 2005, p. 638. ↑ Schmitt 1960, p. 101. ↑ Slavicek 2010, pp. 41–43, 58. ↑ MacMillan 2003, p. 202. 1 2 Weinberg 1994, p. 14. ↑ Slavicek 2010, p. 44. ↑ Brezina 2006, p. 21. ↑ Yearwood 2009, p. 127. ↑ Martel 2010, p. 272. ↑ Slavicek 2010, p. 37. ↑ Bell 1997, p. 22. ↑ Marks 1978, p. 231. 1 2 Marks 1978, pp. 231–32. ↑ Young 2006, pp. 133–35. ↑ Young 2006, pp. 135–36. ↑ Binkley & Mahr 1926, pp. 399–400. ↑ Morrow 2005, p. 290. ↑ Binkley & Mahr 1926, p. 400. ↑ Boemeke, Feldman & Glaser 1998, pp. 537–38. ↑ Bell 1997, p. 21. 1 2 Albrecht-Carrié 1940, p. 15. 1 2 3 Martel 2010, p. 156. ↑ Boemeke, Feldman & Glaser 1998, p. 410. ↑ United States Department of State 1921, p. 46. ↑ United States Department of State 1921, p. 47. 1 2 3 4 5 6 7 Marks 1978, p. 237. 1 2 Marks 1978, p. 236. ↑ Crafts & Fearon 2013, p. 113. ↑ Marks 1978, pp. 223–34. ↑ World Peace Foundation 1922, p. 18. 1 2 3 4 Marks 1978, pp. 234–35. ↑ Crampton 1987, p. 84. ↑ Taylor 2001, p. 59. ↑ Taylor 2001, p. 60. ↑ Marks 1978, pp. 235–36. ↑ Marks 1978, pp. 239–40. 1 2 Marks 1978, p. 240. ↑ Marks 1978, p. 241. ↑ Hehn 2005, p. 66. ↑ Marks 1978, p. 243. ↑ Bell 1997, pp. 24–25. ↑ Marks 1978, p. 244. ↑ Martel 1999, p. 26. ↑ Schwarzschild 1942, p. 140. 1 2 3 4 Marks 1978, p. 245. ↑ Marks 1978, p. 246. 1 2 Bell 1997, pp. 37–38. ↑ Crafts & Fearon 2013, pp. 82, 114. ↑ Marks 1978, p. 249. ↑ Marks 1978, pp. 249–50. 1 2 Backhaus 2012, p. 70. 1 2 Bell 1997, p. 38. ↑ Marks 1978, pp. 250–51. 1 2 Young 2006, p. 171. ↑ Marks 1978, pp. 251–52. ↑ Shamir 1989, p. 25. ↑ Marks 1978, p. 251. ↑ Young 2006, pp. 171–72. ↑ Young 2006, p. 174. ↑ Shamir 1989, pp. 56–58. ↑ Crafts & Fearon 2013, p. 155. ↑ Albrecht-Carrié 1960, p. 200. ↑ Harsch 2009, p. 160. ↑ Temin & Toniolo 2008, p. 137. ↑ Temin & Toniolo 2008, pp. 137–38. ↑ Mommsen & Foster 1988, p. 454. ↑ Joshi 2005, p. 78. 1 2 Grenville & Wasserstein 2000, p. 140. ↑ Kindleberger 1986, p. 19. 1 2 3 Marks 1978, p. 233. 1 2 3 4 5 Boemeke, Feldman & Glaser 1998, p. 424. ↑ Schuker 1988, p. 11. ↑ Martel 1999, p. 43. 1 2 Weinberg 1994, p. 16. ↑ Suddath, Claire (4 October 2010). "Why Did World War I Just End?". Time. Retrieved 29 July 2014. ↑ United States Department of State 1921, pp. 46–48. ↑ Martel 1999, p. 35. ↑ Boemeke, Feldman & Glaser 1998, p. 417. 1 2 Henig 1995, p. 62. ↑ Tooze 2007, p. 7. 1 2 Peukert 1993, p. 62. 1 2 Boemeke, Feldman & Glaser 1998, pp. 420–21. ↑ Boemeke, Feldman & Glaser 1998, p. 413. 1 2 3 Taylor 1991, p. 44. ↑ Bell 1997, p. 37. ↑ Winkler 1933, pp. 86–87. 1 2 Martel 1999, p. 24. ↑ Bell 1997, pp. 38–39. 1 2 Hantke & Spoerer 2010, p. 849. ↑ Hantke & Spoerer 2010, p. 851. ↑ Hantke & Spoerer 2010, p. 860. ↑ Hantke & Spoerer 2010, p. 861. ↑ Boemeke, Feldman & Glaser 1998, pp. 409–10, 425. ↑ Lentin 2012, p. 26. ↑ Marks 1978, p. 239. ↑ Bell 1997, p. 25. ↑ Campbell 1942, p. 161. ↑ Keynes 1920, p. 146. ↑ Keynes 1920, pp. 86–87. ↑ Keynes 1920, p. 215. ↑ Keynes 1920, p. 200. ↑ Keynes 1920, p. 79. ↑ Keynes 1920, p. 265. ↑ Keynes 1920, p. 226. ↑ Keynes 1920, pp. 94–95. ↑ Campbell 1942, p. 160. ↑ Campbell 1942, pp. 161–62. ↑ Albrecht-Carrié 1940, p. 16. ↑ Campbell 1942, p. 162. ↑ Campbell 1942, p. 163. 1 2 Cord 2013, p. 41. ↑ Mantoux 1952, pp. 162–63. ↑ Taylor 1991, p. 70. ↑ Immerman 1998, p. 10. ↑ Harcourt 2012, p. 21. ↑ Martel 1999, p. 42. ↑ Schuker 1988, p. 7. ↑ Evans 2008, Hitler and the Origins of the War. ↑ Slavicek 2010, p. 95. ↑ Boemeke, Feldman & Glaser 1998, p. 401. ↑ Davies 2007, p. 133. ↑ McNeese 2010, p. 19. ↑ Boemeke, Feldman & Glaser 1998, p. 425. ↑ Boemeke, Feldman & Glaser 1998, p. 426. ↑ Feldman 1997, p. 339. ↑ Feldman 1997, p. 430. ↑ Boemeke, Feldman & Glaser 1998, p. 445-6. ↑ Peukert 1993, p. 197. ↑ Martel 2010, p. 183. ↑ Boemeke, Feldman & Glaser 1998, p. 502. ↑ Feinstein 1995, p. 32. ↑ Marks 2013, pp. 632–59. ↑ Marks 1978, p. 255. ↑ Marks 1978, p. 238. 1 2 Marks 1978, p. 232. ↑ Marks 1978, p. 254. ↑ Schmitt 1960, p. 107. ↑ Liberman 1995, p. 89. ↑ Kitchen 2006, p. 67. ↑ Keylor 2013, The Demonization of Versailles. ↑ Boemeke, Feldman & Glaser 1998, p. 524. ↑ Boemeke, Feldman & Glaser 1998, p. 357. ↑ Henig 1995, p. 65. Events in the year 1921 in Germany. Carl Melchior was born in Hamburg. Melchior studied law and eventually was appointed a judge, and later became a German banker and vice-president of the Bank for International Settlements. Étienne Mantoux was a French economist, born in Paris. He was the son of Paul Mantoux. He is probably best known for his book The Carthaginian Peace, or the Economic Consequences of Mr. Keynes published two years after it was completed and one year after his death. 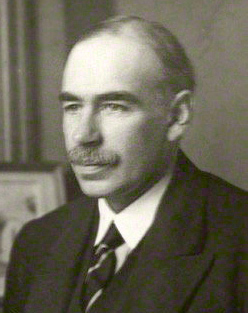 In it, he sought to demonstrate that much of John Maynard Keynes' beliefs about the consequences of the Treaty of Versailles for Germany as expressed in The Economic Consequences of the Peace were wrong. The London Agreement on German External Debts, also known as the London Debt Agreement, was a debt relief treaty between the Federal Republic of Germany and creditor nations. The Agreement was signed in London on February 27, 1953, and came into force on September 16, 1953. 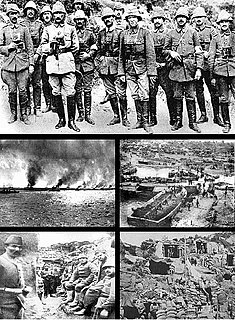 Reparations were paid to Yugoslavia in the aftermath of World War II. The State Reparations Commission of the Yugoslav Government estimated the total war damages inflicted upon Yugoslavia in World War II at approximately US$47 billion. The Heavenly Twins was the name assigned to two British delegates, the Judge Lord Sumner and the Banker Lord Cunliffe, during the 1919 Treaty of Versailles negotiations who were to set the terms of the peace to be imposed on Germany following the end of World War I. The two lords, together with the Prime Minister of Australia Billy Hughes, were responsible for presenting the British and British Dominions' case concerning the amount of compensatory payments, or war reparations, that were to be extracted from Germany. Albrecht-Carrié, René (March 1940). "Versailles Twenty Years After". Political Science Quarterly. 55 (1): 1–24. doi:10.2307/2143772. JSTOR 2143772. Albrecht-Carrié, René (1960). France, Europe and the Two World Wars. E. Droz. ISBN 978-2-600-04276-5. Backhaus, Jürgen (2012) . The Beginnings of Scholarly Economic Journalism: The Austrian Economist and The German Economist. The European Heritage in Economics and the Social Sciences. Springer. ISBN 978-1-461-40078-3. Bell, P.M.H. (1997) . The Origins of the Second World War in Europe (2nd Edition). Pearson. ISBN 978-0-582-30470-3. Beller, Steven (2007). A Concise History of Austria. Cambridge Concise Histories. Cambridge University Press. ISBN 978-0-521-47886-1. Binkley, Robert C.; Mahr, Dr. A. C. (June 1926). "A New Interpretation of the "Responsibility" Clause in the Versailles Treaty". Current History . 24 (3): 398–400. Boemeke, Manfred F.; Feldman, Gerald D. & Glaser, Elisabeth, eds. (1998). Versailles: A Reassessment after 75 Years. Publications of the German Historical Institute. Cambridge University Press. ISBN 978-0-521-62132-8. Boyer, Paul S.; Clark, Clifford E.; Hawley, Sandra; Kett, Joseph.F & Rieser, Andrew (2009). The Enduring Vision: A History of the American People, Volume 2: From 1865. Cengage Learning. ISBN 978-0-547-22278-3. Brezina, Corona (2006). The Treaty of Versailles, 1919:: A Primary Source Examination of the Treaty That Ended World War I. Primary Sources of American Treaties. Rosen Central. ISBN 978-1-4042-0442-3. Campbell, Claude A. (Jan 1942). "Economic Errors of the Treaty of Versailles". Southwestern Social Science Quarterly (23): 160–165. Retrieved 2013-05-17. Cord, Robert (2013). Reinterpreting the Keynesian Revolution. Routledge. ISBN 978-0-203-07752-8. Crafts, Nicholas & Fearon, Peter (2013). The Great Depression of the 1930s: Lessons for Today. Oxford University Press, USA. ISBN 978-0-199-66318-7. Crampton, R.J. (1987). A Short History of Modern Bulgaria. Cambridge University Press. ISBN 978-0-521-25340-6. Davies, Norman (2007). Europe at War 1939–1945: No Simple Victory. Pan Books. ISBN 978-033035-212-3. Evans, Richard (2008). "Hitler and the origins of the war, 1919–1939". Gresham College . Retrieved 27 April 2014. Feinstein, Charles H. (1995). Banking, Currency, and Finance in Europe between the Wars. Oxford University Press, USA. ISBN 978-0-198-28803-9. Feldman, Gerald D. (1997) . 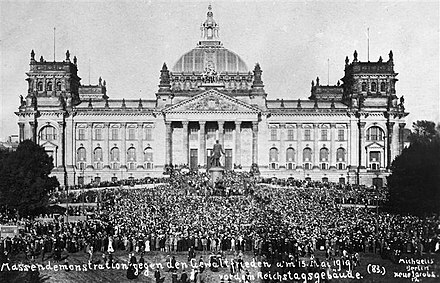 The Great Disorder: Politics, Economics, and Society in the German Inflation 1914–1924. Oxford University Press, Inc. ISBN 978-0-195-10114-0. Grenville, J.A.S & Wasserstein, Bernard (2000) . The Major International Treaties of the Twentieth Century. Routledge. ISBN 978-0-415-14125-3. Hantke, Max; Spoerer, Mark (2010). "The imposed gift of Versailles: the fiscal effects of restricting the size of Germany's armed forces, 1924-9" (PDF). The Economic History Review. 63 (4): 849–864. doi:10.1111/j.1468-0289.2009.00512.x. Harcourt, G. C. (2012). On Skidelsky's Keynes and Other Essays: Selected Essays of G. C. Harcourt. Palgrave Macmillan. ISBN 978-0-230-28468-5. Harsch, Donna (2009). German Social Democracy and the Rise of Nazism. University of North Carolina Press. ISBN 978-0-80785-733-5. Hehn, Paul N. (2005). A Low Dishonest Decade: The Great Powers, Eastern Europe, and the Economic Origins of World War II, 1930–1941. Bloomsbury 3PL. ISBN 978-0-826-41761-9. Henig, Ruth (1995) . Versailles and After: 1919–1933. Routledge. ISBN 978-0-415-12710-3. Immerman, Richard H. (1998). John Foster Dulles: Piety, Pragmatism, and Power in U.S. Foreign Policy. Biographies in American Foreign Policy (Book 2). Rowman & Littlefield Publishers. ISBN 978-0-8420-2601-7. Joshi, Srivastava (2005) . International Relations. GOEL Publishing House. ISBN 978-8-185-84270-7. Keylor, William R. (2013). "The Demonization of Versailles". H-Diplo. Retrieved 27 April 2014. Kitchen, Martin (2006). Europe between the wars. Pearson Longman. ISBN 978-0-582-89414-3. Kindleberger, Charles Poor (1986). The World in Depression, 1929–1939. University of California Press, Ltd. ISBN 978-0-520-05592-6. Lentin, Antony (Jan 2012). "Germany: a New Carthage?". History Today: 20–27. Retrieved 2013-05-28. Liberman, Peter (1995). Does Conquest Pay? The Exploitation of Occupied Industrial Societies. Princeton Studies in International History and Politics. Princeton University Press. ISBN 978-0-691-02986-3. MacMillan, Margaret (2003). Peacemakers: The Paris Peace Conference of 1919 and Its Attempt to End War. John Murray. ISBN 978-0-719-56237-2. McNeese, Tim (2010). Jensen, Richard, ed. World War II 1939–1945. Discovering U.S. History. Chelsea House Publications; 1 edition. ISBN 978-160413-358-5. Mantoux, Étienne (1952). The Carthaginian Peace: Or the Economic Consequences of Mr. Keynes. Scribner; First Edition. Marks, Sally (September 1978). "The Myths of Reparations". Central European History. 11 (3): 231–255. doi:10.1017/s0008938900018707. JSTOR 4545835. Marks, Sally (September 2013). "Mistakes and Myths: The Allies, Germany, and the Versailles Treaty, 1918–1921". The Journal of Modern History. 85 (3): 632–659. doi:10.1086/670825. JSTOR 10.1086/670825. Martel, Gordon, ed. (1999). Origins of the Second World War Reconsidered Second Edition. Routledge. ISBN 978-0-415-16325-5. Martel, Gordon, ed. (2010). A Companion to Europe 1900–1945. Wiley-Blackwell; 1 edition. ISBN 978-1-4443-3840-9. Mommsen, Hans & Foster, Elborg (1988). The Rise and Fall of Weimar Democracy. The University of North Carolina Press. ISBN 978-0-807-84721-3. Morrow, John H. (2005). The Great War: An Imperial History. Routledge. ISBN 978-0-415-20440-8. Peukert, Detlev J.K. (1993) . The Weimar Republic. Hill and Wang. ISBN 978-0-809-01556-6. Schuker, Stephen A. (1988). American "Reparations" to Germany, 1919-33. Princeton Studies in International Finance. ISBN 978-0-881-65233-8. Schuker, Stephen A. (1976). End of French Predominance in Europe: Financial Crisis of 1924 and the Adoption of the Dawes Plan. The University of North Carolina Press. ISBN 978-0-807-81253-2. Schmitt, Bernadotte (Feb 1960). "The Peace Treaties of 1919–1920". Proc. Am. Philos. Soc. 104 (1): 101–110. JSTOR 985606. Schwarzschild, Leopold (1942). World in trance: From Versailles to Pearl Harbor. L.B. Fischer Publishing Corp.
Shamir, Haim (1989). Economic Crisis and French Foreign Policy: 1930–1936. Brill Academic Pub. ISBN 978-9-004-08958-7. Simkins, Peter (2002). The First World War: Volume 3 The Western Front 1917–1918. Osprey Publishing. ISBN 978-1-84176-348-4. Simkins, Peter; Jukes, Geoffrey & Hickey, Michael (2003). The First World War: The War to End All Wars. Osprey Publishing. ISBN 978-1-84176-738-3. Slavicek, Louise Chipley (2010). The Treaty of Versailles. Milestones in Modern World History. Chelsea House Publications. ISBN 978-1-60413-277-9. Taylor, David (2001). Modern World History for OCR specification 1937. Heinemann Educational Publishers. ISBN 978-0-435-30831-5. Taylor, A.J.P. (1991) . The Origins of the Second World War. Penguin Books. ISBN 978-0-140-13672-2. Temin, Peter & Toniolo, Gianni (2008). The World Economy between the Wars. Oxford University Press, USA. ISBN 978-0-195-30755-9. Tucker, Spencer C. & Roberts, Priscilla (2005). The Encyclopedia of World War I : A Political, Social, and Military History. ABC-CLIO. ISBN 978-1-85109-420-2. 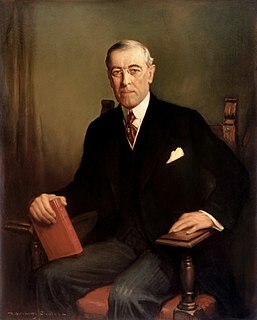 United States Department of State (1921). "Papers relating to the foreign relations of the United States, 1921 Volume II". Foreign Relations of the United States. United States Government Printing Office. Weinberg, Gerhard L. (1994). A World at Arms: A Global History of World War II. Cambridge University Press. ISBN 978-0-521-44317-3. Winkler, Max (1933). Foreign Bonds: An Autopsy (1933 ed.). Beard Books. ISBN 978-1-893-12243-7. World Peace Foundation (1922). October 1917 – August 1930 Volume 5. World Peace Foundation pamphlets, v.1–12. World Peace Foundation. Yearwood, Peter J. (2009). Guarantee of Peace: The League of Nations in British Policy 1914–1925. Oxford University Press. ISBN 978-0-19-922673-3. Young, William (2006). German Diplomatic Relations 1871–1945: The Wilhelmstrasse and the Formulation of Foreign Policy. iUniverse, Inc. ISBN 978-0-595-40706-4. Gomes, Leonard. German Reparations, 1919-1932: A Historical Survey (Springer, 2010).